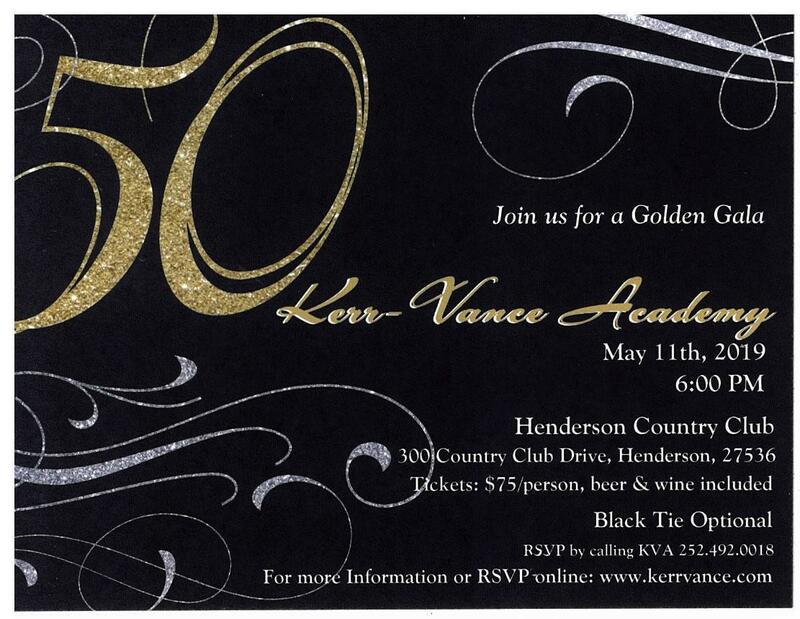 You are invited to the Golden Gala to celebrate Kerr-Vance Academy’s 50th year! Please join us on May 11th, at the Henderson Country Club for an evening of reunion and celebration. We hope to see many current parents as well as several familiar faces from years gone by. This event is open to anyone who currently has a connection or has had a connection with Kerr Lake School, Vance Academy or Kerr-Vance Academy over the past fifty years. Please help spread the word to your family, former classmates, former staff members of KVA, former parents and friends of the school. The only requirement is that registration be completed online or by calling the school. Registration for the event is $75/ person which includes dinner, drinks and dancing; the attire for the evening is black tie optional and it begins at 6pm. We will celebrate this milestone in style! Please go to https://kvagoldengala.rsvpify.com to register and pay online (you may easily register online and pay by mail) or call the school to register and pay by mail. We look forward to seeing everyone on May 11th!